Camp Arcadia welcomes guests with the simple charms of a resort built more than three-quarters of a century ago (1922). From the Inn’s traditional white clapboard, green-trimmed exterior and homey red-checkered table runners on our dining room tables, to the historic waterfront meeting space in the Assembly, to the hand-painted Native American and Western motifs in the Wigwam building’s Round Up and Trading Post, Camp Arcadia is a place where we escape from the hustle of our modern lives and is a place for reconnection with God and family. The Craft Shop received new windows and siding. We also added a ventilation system to cool down summer crafters and heat so they can stay warmer later in the fall. The ball field bathrooms, located just west of the ball field. and are complete with men's and women's restrooms and storage for program supplies. No more quick dashes back to Camp with the little one who just can't wait! Camp’s three main buildings are located around a central patio area on the Lake Michigan shoreline. All buildings have ramps and are wheelchair accessible. Guests may enjoy Camp’s large game room (called the Round Up) with a piano, ping pong tables, billiards, foosball, indoor bowling & shuffleboard, and card tables. Additional quiet space is also provided for reading or puzzles. Guests stay in our 44-room Inn or in one of five cottages located a short distance from the central resort area. The Inn, built in 1925 and refurbished in 1999, features 40 ‘traditional‘ inn rooms and four ‘private bath‘ inn rooms with lake and wood side views. The Inn also has a central lobby and the dining room. All rooms have a sink, mirror, beds, dresser, and shelving units. Private bath inn rooms also have toilet and tub/shower combination, and are second floor rooms. Most Inn rooms have either a queen and a bunk bed or two queen or double-size beds. Some rooms accommodate more people. Very clean, shared bathrooms are conveniently located up and down the hallways. First floor rooms and bathrooms are handicapped accessible. Children under 15 are housed with their parents; teens 15 and older have the opportunity to share same-gender rooms. 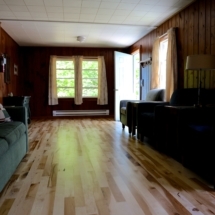 Our “Oak Street” cottages offer vacationers a cozy living room, kitchen and dining area, along with one to four bedrooms (each cottage is a different size), and a private bathroom. Learn more about our cottages. Camp Arcadia is set on 110 acres of lakefront and woodland property, nestled in northwestern Michigan dune and orchard country. Our facilities include a basketball court, tennis courts, baseball/soccer field, a low ropes course, a Craft Shop, Nature activities, hiking trails, shuffleboard courts, and an expanse of unbroken shoreline for exploring and enjoying. See a photo gallery of the Camp Arcadia grounds. See information about nearby activities here. See a video sunset at Camp Arcadia.